2018 Programa de ¡Vamos a Acampar! Stay and play for free at one of the three camping events in Central Oregon! ¡Quédate y juega gratuitamente en uno de los tres eventos en el centro de Oregon! • June 2-3 (one night only) – Tumalo State Park, 5 miles NE of Bend on OB Riley Road. Junio 2-3 (una noche solamente) — Tumalo State Park, 5 millas al noreste de Bend en la calle OB Riley. • Aug. 17-19 (two nights) — The Cove Palisades State Park, 16 miles SW of Madras. Agosto 17-19 (dos noches) — The Cove Palisades State Park, 16 millas al suroeste de Madras. • Aug. 24-26 (two nights) — Prineville Reservoir State Park, 16 miles SE of Prineville. Agosto 24-26 (dos noches) — Prineville Reservoir State Park, 16 millas al sureste de Prineville. Registration for Tumalo event closes Mon, May 21. La registración para Tumalo cerrara el lunes 21 de mayo. Registration for August events closes Monday, August 6. La registración para los eventos en agosto cerrara el lunes 6 de agosto. We provide: Camping gear, Saturday night dinner, and the ingredients to make s’mores. Plus, you will learn about the park, take a guided hike, and try kayaking (August events only). We’ll also help you set up your tent, cook over a campfire, and learn how to be a great camping neighbor. Ofrecemos: Equipo para campamento, la cena del sábado, y los ingredientes para hacer malvaviscos. Además, vas a aprender acerca del parque, participar en una caminata guiada por un guardabosque, y probar paseos en kayak (solo durante los eventos en agosto). También te ayudaremos a construir tu tienda, cocinar en una fogata, y aprender cómo ser un gran vecino de campamento. Questions? Call Jill Nishball, 541-388-6073. ¿Preguntas? Llama a Priscilla Calleros, 541-633-7834. Photo (c) Merlin D. Tuttle, Bat Conservation International, www.batcon.org. National Bat Appreciation Day occurs annually on April 17th. April is a good time of year to observe bats, as they are now beginning to emerge from hibernation. If you see one, be sure not to touch them. It is also an excellent time to learn about the role bats play in nature. One important reason to celebrate bats is that they are considered to be an “insectivorous” creature because they rid our world of many annoying insects. In one hour, a bat can eat up to 1,000 mosquitoes. Oregon bats also happen to feed on a number of pests, such as spruce budworm moths, tussock moths, pine bark beetle moths and gypsy moths. Many bats can see in the dark and use their extreme sense of hearing. Townsend’s big-eared bats (Corynorhinus townsendii) are a medium-sized bat with very long ears. Their fur is pale gray or brown above and buff colored on the underside. Their wingspan is12-13 in (30-34 cm) and they weigh between 0.3-0.5 oz. This bat’s ears are enormous, reaching a length of 38 mm. When the ears are laid back they extend to the middle of its body. They can be found in pine forests and arid desert scrub habitats. When roosting they do not tuck themselves into cracks and crevices like many bat species do, but prefer large open areas. They specialize in eating moths and other insects such as beetles, flies and wasps. Townsend’s big-eared bat is usually a late flier and will forage along the edge of vegetation. 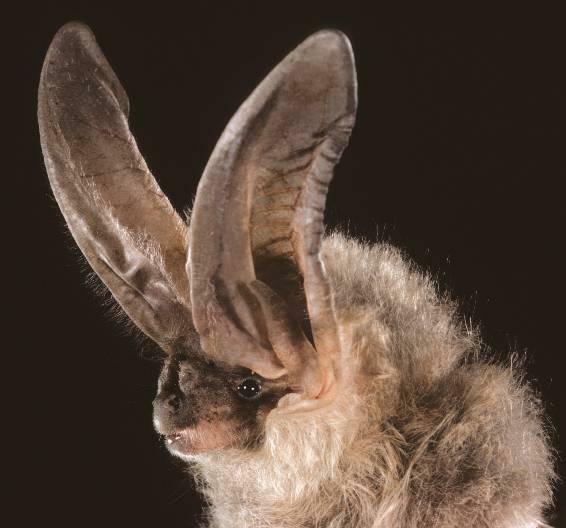 When it’s roosting or hibernating, Townsend’s big-eared bat curls up its long ears so they look like rams horns. When flying they can rapidly extend or contract their ears. When flying with their ears extended the ears point forward and are nearly parallel to their body. This holiday season, give your loved ones a year of unlimited access to Oregon’s state parks with an annual day-use parking permit. From Dec. 1-31, holiday shoppers can buy the annual parking permit for only $25–that’s $5 off the regular price of $30. The permits are transferable from vehicle to vehicle. Shoppers can round out their gift with holiday gear branded with the iconic Oregon State Parks shield, including hats, water bottles, dog bowls, ornaments and stickers. The holiday gear will be on sale during the month of December. Gift gear and parking permits are for sale online at https://store.oregonstateparks.org/. Gift items can also be purchased in person at Oregon State Parks headquarters in Salem, 725 Summer St. NE Suite C. Parking permits are also sold at major OPRD offices, some state park friends’ group stores and selected local businesses throughout the state. List of vendors. Alternately, if you would like to give back to the parks you love, consider becoming a member of — or giving the gift of a membership to — the nonprofit Oregon State Parks Foundation. The Foundation is dedicated to raising funds to enhance the state park experience. Those who give a tax-deductible donation of $45 or more will receive a 12-month day-use parking pass as a thank you. Learn more at www.oregonstateparksfoundation.org. Visitors at Lake Billy Chinook may notice that the lake level has gone down since this fall. Boaters will easily see the waterline is a couple of feet lower than it was. Portland General Electric (PGE) manages lake levels on Lake Billy Chinook to accommodate spring runoff and control flooding downstream. Some years it is necessary to lower it further like in the spring of 2017 to catch above average snow melt. PGE currently plans is to draw the water line down 3 feet by Christmas and keep it there until March and April. The lake level is measured in actual elevation, so full pool is 1,945’ above sea level and hold lake level to approximately 1,942’ after the holidays. 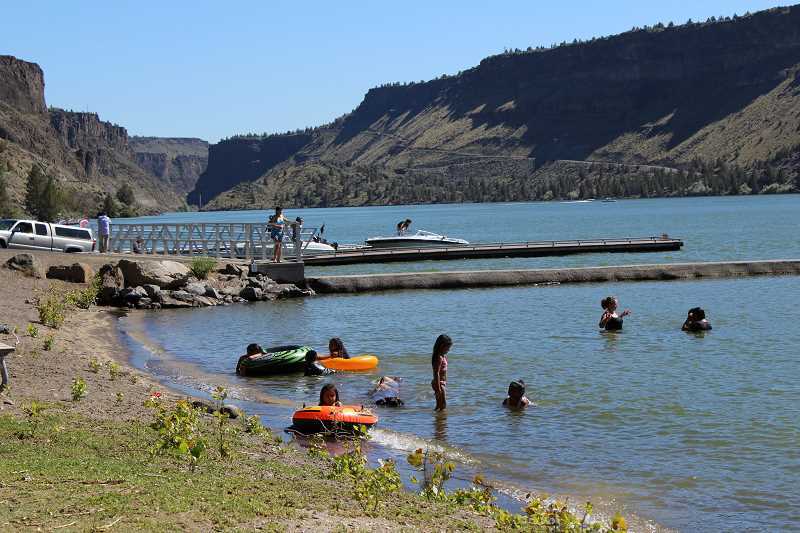 Boating is allowed all year at Lake Billy Chinook however safety is our priority. Snow, high winds, icy conditions and low water can make launching difficult or unsafe. This may require some boat docks to be temporarily closed. Boaters, stay safe, do not try to launch from a closed dock. For current park conditions, call the park office 541-546-3412, Monday – Friday from 7:30 – 4 pm. News Release from Oregon Parks and Recreation Dept. The agency will waive day-use parking fees in 26 Oregon State Parks the day after Thanksgiving. Parking is free year-round at almost all state parks; the waiver applies to the 26 parks that charge $5 daily for parking, including The Cove Palisades State Park. The waiver applies from open to close on Nov. 25, except at Shore Acres State Park, where it expires at 3 p.m. for the Holiday Lights event that runs Thanksgiving through New Year’s Eve. A list of parks that require day-use parking permits is at OSPParking. Is there anything to do at The Cove once the summer season is over? Most definitely! In fact, fall can be one of the most magical times here at the park. The cooler weather makes for a great time to hike the Tam-a-lau Trail. You can access the trail from the Upper Deschutes Day Use Area and embark on a seven mile journey. The initial climb, an elevation gain of 600 feet in the first mile, is worth it when you reach the top and see the spectacular views of the park this trail affords. Who knows? You might even find a pictograph along the way, but you are certain to see some huge rocks, and a sweeping view of Lake Billy Chinook that can’t be beat. As fall arrives, so does the wildlife. This is a great time of year to see some of The Cove’s residents who prefer a bit less human interaction. The Tam-a-lau and the Wetlands Trail are both good places to see wildlife. In fact, just about any trail you wander along could afford you that opportunity. Maybe take a stroll along the water and see if the river otters are out playing. Or just find a nice, quiet, pretty spot to sit and relax and see what wanders along. Don’t think that just because summer is over there’s nothing to do or see here at The Cove. Come on out and take a look. You just might surprise yourself. ►►All Oregon State Park campgrounds are full. This is not the weekend to wing it! the eclipse. Avoid travel on Aug. 21. ►►The usual conveniences may be hard to get to. cash and anything else you can’t live without. ►►Cell phone service may become iffy. ►►Expect campfire bans in central and eastern Oregon. use approved eclipse glasses or filters. For more information at The Cove Palisades State Park, see our eclipse page on The Cove Rattler!